After a leisurely drive from Clayton, North Carolina (Raleigh area) to Opelika, Alabama, delivering a load of Smithfield meat products to a Walmart distribution center I was offered a repower. I was directed to a Super Walmart on the south side of Troy, Alabama, 105 miles away, where a driver was broke down and had a load for a Walmart distribution center in Brundidge, just eight miles farther south. As an aside and further evidence that Stevens has its corporate head up its corporate arse, they picked me to repower the load even though I would not have the hours to complete the run. I would get to Troy at around 8 p.m. with only two hours left on my 14 hour clock and the load was to be delivered at 4:30 the next morning. I could not make it happen, at least not according to DOT rules. I brought this to the attention to one of Stevens’ night dispatchers. I recognized right off that she was an idiot but said she would come up with a solution and get back to me. Oh, she also told me to sit tight. Alrighty then. By the way, the phone rang for 46 minutes before anyone answered the phone. If it had not been a Sunday afternoon I never would have hung on that long but since the minutes were free, I had to see how it would turn out. Stevens loves its drivers so much that they always have enough staff to handle inquiries. When I didn’t hear back from her in 20 minutes I called back with my own solution and dialed her extension. That only took a few minutes but they were minutes wasted just the same. I suggested that when I get to Troy, that we swap trailers but that the driver of the other truck drive my truck to make the delivery. All we’d have to do is is log me off the QualComm and log him in as the driver. She reacted as if I had called her baby ugly AND insulted her sainted mother. “We could NEVER do that-” and I really didn’t hear anymore because I bid her farewell and hung up. I decided I’d sort it out when I got there. Well here’s the exciting part. I never got there. As I was approaching the south side of Troy I saw a veritable Christmas tree of colorful flashing lights and danged if they weren’t blocking every entrance into the Super Walmart. What the h – e – double hockey sticks! I pulled into the turning lane at the last entrance and engaged the emergency crew that was protecting the roadway. Did you know they now have vests with flashing lights on them just for events such as this??? So I drove maybe another third of a mile down 231 and took a right into what was labeled an industrial park. I should certainly be able to find a place to stop and make a couple of phone calls. There would also certainly be a place for me to turn around again, it being an INDUSTRIAL park. Affirmative on the first assumption and negatory on the second. Before I had even stopped at the dead end on my street I got a call from the driver I was supposed to swap with. He said he saw me trying to get in and that the place had been locked down for a couple of hours – bomb scare. I thought that was pretty exciting. The flashing vests were just the icing on the cake. I shared my idea about him driving my truck to the delivery and he was cool with it. While I was still on the phone with him, Stevens dispatch called and wanted to talk about how to get the load delivered. Thankfully it was not Doris, the first “dispatcher” I had spoken to and hung up on. I suggested my idea to her and after conferring with the safety department she said they all thought having the other driver drive my truck was a great idea. Hunh. An osasis of sanity in an insane company. I called the other driver back and said we were cool. He said one of the cops had told him they were making their last sweep of the store and the would open things up within a couple of hours. I told him to call me if it opened in the next 90 minutes or to call me an hour before the delivery and we could make the switch then, when the Walmart would certainly be open again. He called 30 minutes later and I toodled back over to his place. I was able to make a quasi-legit U turn with the help of another trucker team that had pulled into the industrial park and made their own U turn first. All the cops and flashing lights were gone. Cars were already entering the Walmart parking lot although they were entering for naught because they wouldn’t be opening the store itself for another hour. The other driver and I swapped trailers and went to sleep in our respective suites. He was to come on over at 3:45 and we could head down to the drop. It all worked out just fine with a couple of minor hitches. Hitch one was he didn’t have the key for his meat lock. NOr sure if I’ve mentioned this before but we all have our meat locks which are super heavy duty steel clasps that lock around the poles that have the locking levers on them. A simple pair of bolt cutters ain’t gonna breach these babies. They cost us $90! Walmart would not let him leave and come back without hitting him / us with a late fee. So he backed the trailer up to the door and said Walmart had somebody who would come and cut it off. That’s ninety bucks about to be flushed. After we were backed in I suggested (from my sleeper bunk where I was resting) that maybe they’d let him bobtail back to his truck to get the key. It would only take 20 minutes, and they never start unloading you that quick. He got permission to make the bobtail run and we thought we were golden. I finally fell asleep before he got everything handled and got backed up to our door with the trailer doors open. I didn’t wake up until almost 8:30. We still weren’t ready to roll. The paperwork was taking an inordinately long time, nut he finally got it and as we were leaving he told me that while we were driving back to get his meat lock key, the maintenance staff went ahead and but his meat lock off the truck. A FOUR STINKIN’ HOUR unload at a Walmart where they strive to get everybody unloaded in two hours or less. Lesson learned. Always have the key to your meat lock on your person. And be prepared for the arrogant Walmart organization to take advantage of you. It’s Memorial Day as I write this. My thanks to all military veterans, living and dead. And because it’s a holiday I’ve been sitting all day waiting for a load. Just got one. Will be heading to the Florida Panhandle to repower a load with three drops in central and south Florida. Wish me luck. Quick, cute(?) story from my time in the shipper’s office in Salinas, California. Some truckers can be quite talkative. I’ve walked away from several conversations that I started up with an innocent remark at a truck stop or shipper or receiver’s waiting area. Sometimes other truckers will just strike up a conversation with me. Guess I look like a listener. I’ve walked away from several of these encounters with my ears bleeding. He was sore because he had been working out at a health club owned by his brother. He had just started driving truck again because his construction job in Utah went away. He had to wait a bit to get his CDL again this time around because of legal issues that he had to wait on. Okaaaay. Fortunately it was my turn at the window so he redirected his life story to the next guy in line. As for the title of this post, I have noticed that a goodly percentage of truck drivers have bad teeth. I’m not passing judgment. Just making an observation. I can also say that when I am dealing with my contact lenses and brushing my own teeth in truck stop men’s rooms, more often than not there is another trucker brushing his teeth as well. Teeth issues range from lotsa spaces (missing teeth) to discolored or rotting teeth. I just can’t help but notice these things. It wasn’t quite that pronounced, but you get the idea. The guy he was talking to after he finished with me had all his teeth except his two front top teeth. So between them, they had one good (give or take) set of teeth. Had a miserable loading experience in Salinas. I had been given the wrong loading time and had to be shoehorned into the rotation. It took more than seven hours(!) and the personnel were a$$#@!@$. As an added bonus, my reefer unit was acting up. So as soon as I was loaded I drove half a mile to the Thermo King dealership. Because I had traveled such a short distance at a speed of less than 25 miles an hour, even though I had driven a couple of miles, my QualComm had not registered any actual driving time. Plus, I went to “Off Duty – Break” status shortly after arriving at the dock, I was only a short tfew hours from having my 10 hour break completed and my 11 hour driving clock reset. So, after the TK technician replaced the alternator on my reefer, I just pulled out into the parking area in front of their building and crawled into the sleeper. It was 10:30 p.m.
After a few hours of sleep I woke up, scaled my load and got a coffee refill at the Pilot down the street and set out for Cedar Falls, Iowa. Since it was still quite dark, I was able to slip by San Francisco without experiencing any traffic problems. I was taken aback by the toll for the Congressman George Miller Benicia Martinez Memorial Bridge over the Carquinez Strait north of Oakland – TWENTY FIVE DOLLARS! But hey, wasn’t coming out of my pocket. I passed through Sacramento with the predawn glow brightening in the east. The climb up into the Sierra Nevadas was a bit taxing on my Kenworth, but gloriously beautiful. I stopped at a rest area just short of Donner Pass to take a bio-break. The smell of the mountain forest was almost intoxicating. It took me back to the first time I visited the Black Hills – dry, fresh, piney goodness. Rejuvenated, I continued through Reno and fueled up at Loves in Fernley. I had swapped a load there in my second week with Dudley, my first trainer. 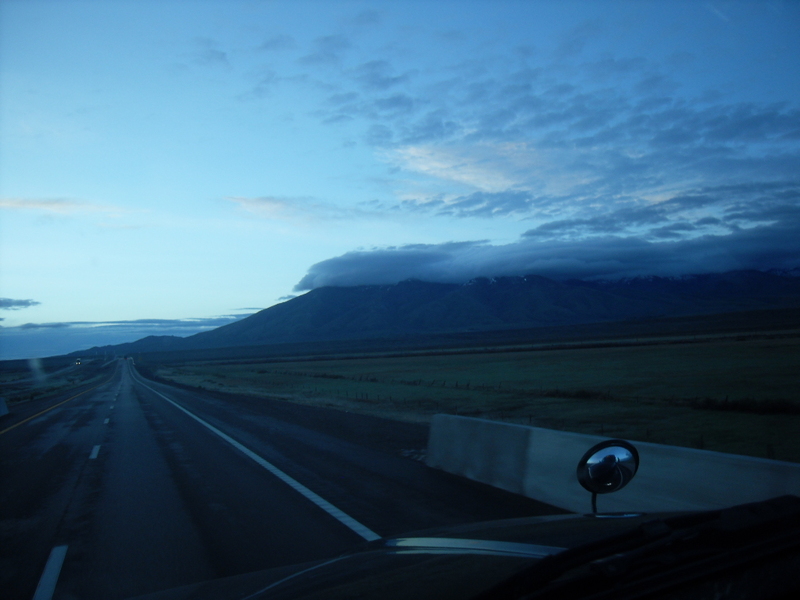 Towards the eastern side of Nevada I saw low grade mountains with snow near the top. I had already seen plenty of snow through Donner Pass and that was much higher. But this snow was shrouded in clouds. Passing by the last of the casinos in Nevada I entered Utah at the Bonneville Salt Flats. Aptly named because IT. IS. FLAT. 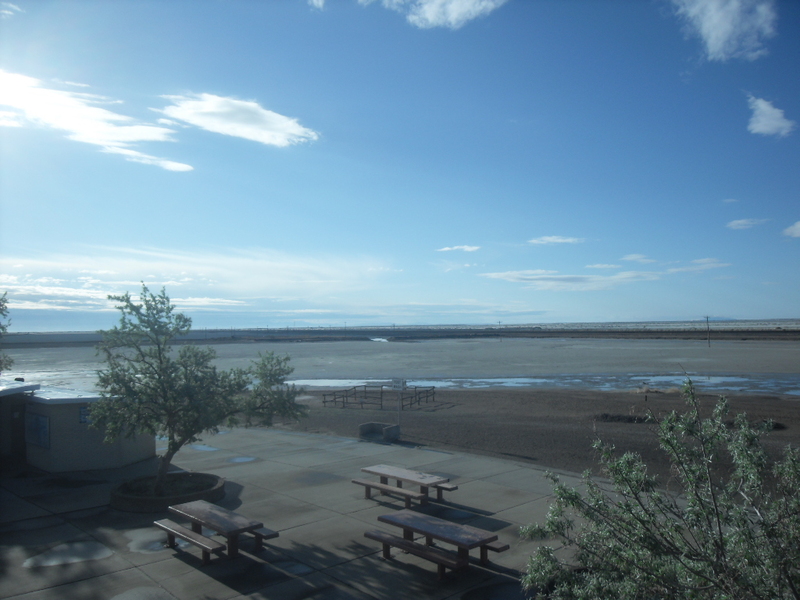 Here’s the view to the southeast from a rest stop off I 40 near the Bonneville Salt Flats. Another shot at The Flats. 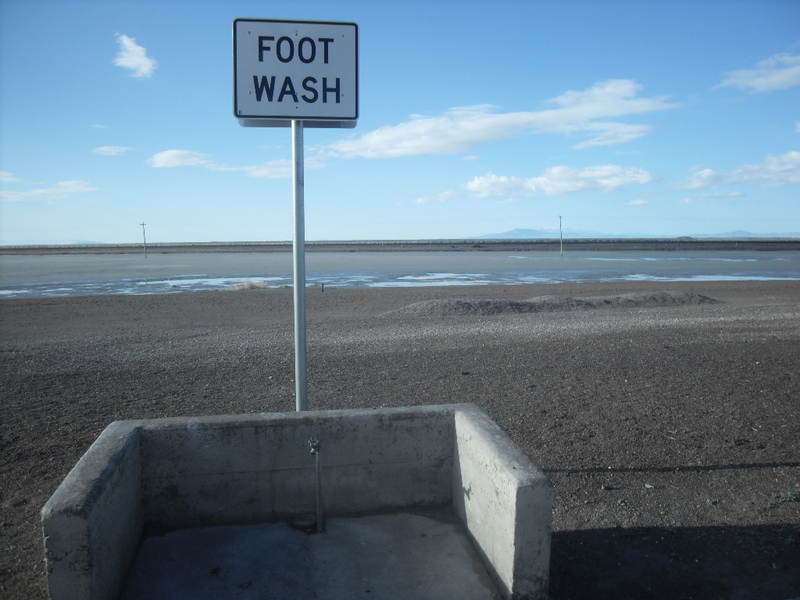 Evidently people who hike around in the salt don’t want to track it back to their cars. The road across the salt flats is painfully straight. Evidently a lot of drivers fall asleep and run off the road (and sometimes die!) because there are signs every couple of miles warning you not to drive fatigued. I was too late to get a shot of it, but around one of these signs there were ruts running off the road into the muck just in front of the sign mirrored by ruts of the same vehicle (I would assume) that had been towed out of the muck on the other side of the sign. This driver was evidently too tired to read the sign. I love driving through Wyoming. W I D E O P E N S P A C E S. I saw several herds of antelope. I got as far as Rawlins, Wyoming, before I ran out of hours. The next day I continued on through Cheyenne, where I hit the literal high point of my trip – 8,200 feet. The skies were threatening as I entered Nebraska. Curiously, the most common animal I saw was turkey. Bet I saw a dozen flocks pecking in the broad ditches alongside the freeway. By the way, did you know that Benjamin Franklin lobbied to have the Turkey named the national bird instead of the Bald Eagle? He thought the eagle was as beautiful creature but was a scavenger as much as anything. He thought the turkey better represented the clever, effective, strong character of America. 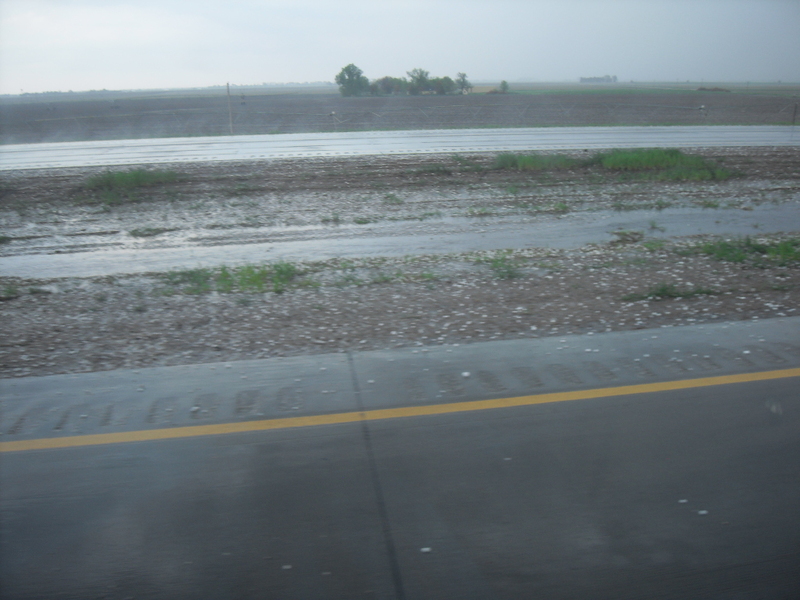 A less than excellent shot of the hail in western Nebraska. About midway through my turkey spotting, traffic slowed and I noted that there were dozens of cars and trucks pulled off to the side of the road. Hmmm. No sign of a chain-reaction accident. A half mile down the road I saw the reason – hail. Evidently just short of the hail, which ranged to quarter- sized, these drivers experienced rain so torrential, they pulled over and stopped. I heard my trucker brethren on my CB cussing the wussy four-wheelers for slowing things down. I made it as far as the Petro in York before I stopped for the night. A Super Walmart walking distance away and prime rib at the truck stop restaurant buffet made it a better than average stop. I always get a to-go box at these buffets. They charge anywhere from $4.50 to $6.00 per pound. Since I already had leftover veggies, I just got a small container of prime rib. It only cost $1.96! And the dude who was carving the meat cut it up for me!! Jackpot!!! End cut. It was delicious. I was able to sleep in the next morning since my drop in Cedar Falls wasn’t scheduled until 4:30 p.m. I almost slept in too long. My OptiStop (fuel stop) directed me to a Sapp Brothers station on the west side of Omaha. They were doing some construction at the station and while they had three lanes open, one was blocked by a truck that was sticking out of a service bay. It took more than 10 minutes to even get to a pump. Then, because Sapp Brothers is retro, I had to go inside to prepare to pump since they didn’t have that capability at the pump. So far, so mediocre. I ran into the real delay when I went back in to settle up. They couldn’t get my card to work. I wasted another 20 minutes waiting. Since I was going to grab a shower I suggested to the clerk that I do that while they sorted things out. No. They might need more information from me. Sigh. I got them paid. Took a quick shower (below average). And put the pedal as close to the metal as I could. I got to the Target Distribution Center with barely a minute to spare. A short three and a half hours later I was unloaded and trying to beat the storms to a truck stop. This was the same day that Oklahoma City, rather Moore, got hammered with that Class 5 tornado. I knew weather was coming. Knowing I wouldn’t get another load assignment until morning and knowing there was space available at a Flying J in Waterloo a dozen miles to the east, I hit the road. A mile down US 20 I got a message. I pulled over and retrieved the load assignment that would take me to a Swift Meat plant in Marshalltown for a load that would take me to Atlanta. The pickup was in the opposite direction so I made a cloverleaf U-turn and headed back to the west. I knew of a truck stop about 12 miles back. The darkening skies were continually lit up with streaks of lightening. The wind gusted with increasing velocity. By the time I pulled into the truck stop, the rain was blowing horizontal. Anything that wasn’t lashed down at the station was blowing across the lot. This included signs and trash receptacles. There were no regular parking slots left so I pulled up to a curb and made a call to the shipper. He indicated the storm was just hitting them an hour to the south so we agreed that I would not make that drive until morning. Good thing. Two-lane roads most of the way. It would NOT have been fun drive. The wind rocked me to sleep. It was a pretty full day. I am referring to my trip from Los Angeles – Ontario, actually – to Salinas, about 80 miles south of San Francisco. I was empty so the climbs up the mountains allowed me to pass dozens of other trucks as they were struggling up the 4 – 6% grades. And the descents were a breeze since I didn’t have 40,000 pounds of cargo forcing me down the hills at potentially breakneck speeds. Before I get to the geography lesson and the photos, let me recap my arrival in California. I finally got to Greater LA after the tools at TA Phoenix finally got my APU fixed. The downtime actually allowed me to score another 34 hour reset so I had lotsa hours to play with. About 30 minutes after I was fixed I got a message saying that my delivery appointment had been pushed back 24 HOURS. Nobody could tell me why. I now had two full days to drive 54o miles. Since that was double what I needed I messaged in for a repower. Knowing that an electronic repower request alone had never once gotten me a new load, I followed up with phone calls. A NUMBER of phone calls. I think I made my fill-in Driver Manager cry once. Be careful what you wish for. After I got to L.A. and was on I-20 about halfway through the metro area, I got a repower. I would have to backtrack 40 miles and do a local delivery, but at least I would be off my load and ready to pick up another one the next morning, so I found my way back to the Kenworth dealership in Fontana where the other guy was getting his truck repaired. I saw the other rig waiting near the service driveway. The driver informed me that he was all fixed and would be able to complete his delivery. After listening to my expletive-laced response, he reevaluated, and decided we could go ahead and swap. So we switched trailers. Turns out the trailer I was giving him had a flat, but other than a moment’s guilt, we completed the swap. Not wanting to wait for the official electronic instructions for getting to my new delivery, I just loaded the address on the Bill of Lading into my QualComm navigation. That was a mistake. I was guided through a nice little lower class residential neighborhood to the back end of an industrial park. “We’re here,” said the Nav Chick. I was stopped on the paved road and looked down the gravel road to the back end of a large industrial building more than a quarter mile away. I thought a minute and decided I had been down worse roads and turned onto the gravel road and went until it was clear that it would NOT lead me to a delivery. Sigh. I called the receiver and got the correct address. It was 13.4 miles away. I told him I’d get there as soon as I could. I got out of my truck and looked through the cloud of dust back up the gravel road. No way to turn around. Did I mention the gravel road was right next to a railroad track. So I slipped the transmission into reverse and backed up to the road, got out again and looked up and down the paved road, and backed across the paved road. I took a deep, dusty breath, let a car and a school bus pass (of course the school bus had to stop at the RR tracks and open its doors), and got started for the correct destination. Delivery made (there was a $222 late fee – not my fault, the load was late because the other driver had broken down), I sent in my “Empty at Final” message and made my way back to the TA in Ontario. This was the same TA where I had called 911 for my trainer who was just sinking into his diabetic coma. My hope was that I would get a load before I was parked for the night. There was no preplan. Nor was there a preplan in the morning. Nor was there a preplan at noon. I had had several direct conversations with the fine Stevens personnel in Dallas. My DM, who had been on medical leave for the last month, was his typical non-helpful self. “Freight is slow,” he messaged. That led to several emails to the Lead Counselor who I had begged to release me from the company. My begging was for naught, but I promised that she would be hearing from me again. I wrote,”If freight is slow and I’m not driving, it obviously means you have a surplus of drivers. You can ease the surplus by letting me drive off into the sunset.” I reported the lack of miles and all the BS they were shoveling my was. “Awww. That’s too bad,” she thoughtfully replied. That made my first phone conversation with my newly returned DM rather heated. If his stitches weren’t fully healed, there might have been some seepage from his incision. Saw clouds from a long way off. Turned out to be smoke. 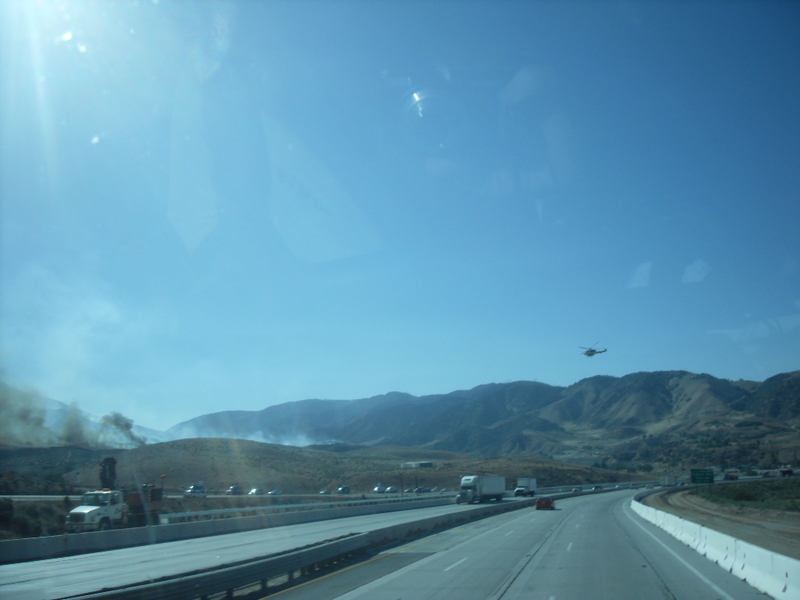 A wildfire off I-5. This explained all the news vans passing me on the freeway. 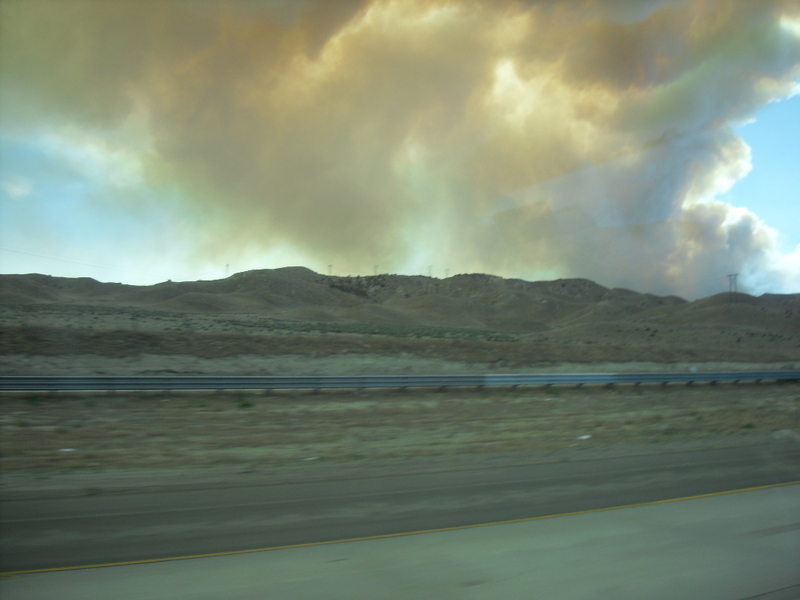 I finally reached the source of the smoke and saw the burning landscape. The little speck on the right of the photo is a helicopter. A few miles down the road, I saw where the helicopters were coming from. They were sucking up water from a lake and transporting it to the fire. I continued north of I-5 and hit the flatlands. Another 50 miles up the road and I was routed off the freeway and a onto a sometimes 2- and sometimes 4-lane highway west. 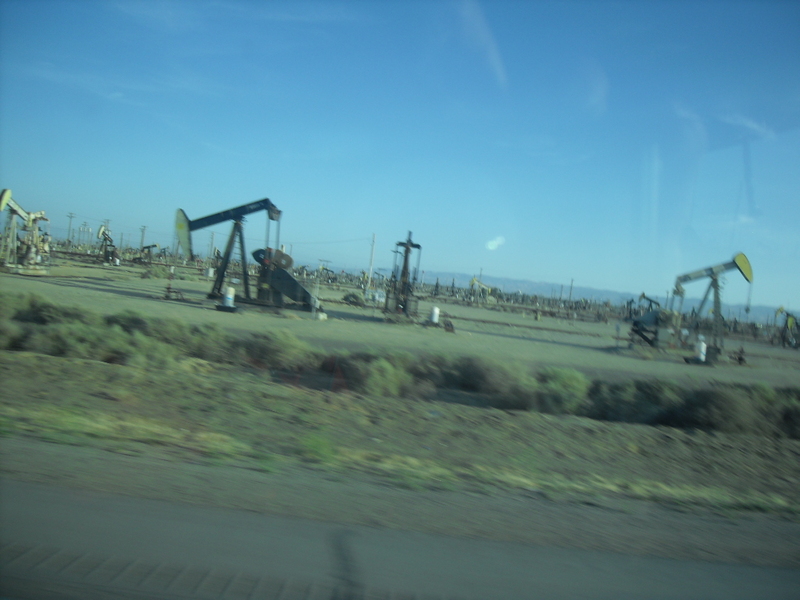 I saw fruit trees, almond trees, large fields of undetermined vegetables, and a huuuuge cattle feedlot. While I would have expected free range cows, and saw a lot of them, this was one big feed lot. I hit the recirculate button on my A/C just in time and avoided the stench. I continued west on CA 46 and got into some serious wine country. It was getting dark so the photos just didn’t work. Paso Robles was as far as I went on 46 and it was beautiful and jumping. The two RV parks I saw were packed. More than 90 percent of the occupants were tipsy from all the wine tasting, I’m sure. I reached Salinas just before 10 and found a slot at “The Big Dirt Lot” a quarter mile north of the produce processor I would be visiting in the morning. Good night. I had a moderately good attitude – at least for me – working for this POS company – and then I went into the shipping office here in Salinas, California, to check in for my 2 p.m. appointment to get my load of produce. I had tried to check in at 1 p.m. but they wouldn’t allow it. “Come back at two,” the clerk said in his accented English. So at 2 o’clock (and I was the fifth guy in line), after significant discussion behind the bulletproof glass, I was told that my appointment was, in fact, at noon. I was late. But we can work you in at 3:30. Now I acknowledge that I have a moderate tremor (I shake for no apparent reason), but at this point I was trembling with rage. My initial thought was the home office sent me the appointment time for Central Daylight Time. I was in the Pacific Time Zone, which would be two hours earlier. Appointment times, it had been drilled into me, was always LOCAL time. So I had a direct conversation with our produce department. I had tried to reach my Driver Manager but once again got his VM and am fully aware that he does not return phone calls. The produce dude was apologetic and made a call which resulted in a 3:00 checkin so I will save 30 minutes. Big Whoop. How is it possible that one company can screw up almost everything that touches me? I have the answer. Since I have been the squeaky wheel, they have elected that rather than grease, they should provide large quantities of SAND! And the rub it in. And I had such a nice ride up here from LA. Will cover the trip in my next post. Note the empty crawler. No part even though it was ordered from only 30 miles away five hours ago. Still sitting at the TA in Tonopah, AZ. I was at the service counter at 7 a.m. when they ordered the part. That was FIVE STINKIN’ HOURS AGO! I was just informed that either my part went to the wrong TA or the courier got the wrong part, I couldn’t understand which. Bottom line: somebody is going back to get it and it will be an hour and a half before they can begin to complete my simple repair. HAH! The airbag goes somewhere in the top center of this photo … eventually. There is so much that is beyond the control of a truck driver. If it was just driving truck, this would be a great, if low-paying, gig. As it is, being a truck driver is an ongoing lesson in patience and attitude control. Unfortunately for me, for most of my life I have been an impatient jerk. I thought I had made remarkable progress on this front over the past ten years. I am now reverting to my old impatient self. I gotta find a trucking gig that pays a day rate or hourly wage, or pays me enough to float me through these lulls. As it is, it is impossible for me to be blase about other jerks interfering with my ability to earn a living. For the record, I have only had one decent experience with service work performed by TAs. That one event was the simple removal of a trailer skirt that had been damaged before I picked it up. The job required a workman with a wrench. He didn’t have to do anything except remove a (rather large) part. He did it expeditiously and didn’t screw it up. That was at a PETRO (same company as TA) in Carlisle, Pennsylvania. After an interesting trip to Laredo, where a meat drop at a forwarding facility took six times longer than the last time I had visited the exact same place only three weeks earlier, I dropped light load of Mexican produce in Broussard, Louisiana (although I repeat myself since Broussard shouts LOUISIANA all by itself) and was unloaded by 6 a.m. 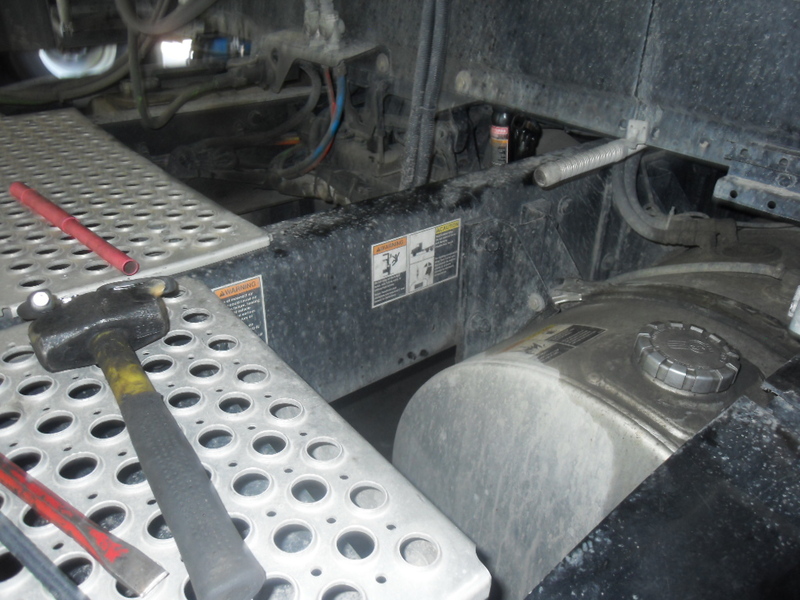 Since I had been having APU problems YET AGAIN, after I dropped the produce I headed over to the Baton Rouge Thermo King dealership for a fix. I was low enough on hours that I needed a 34 hour reset, and I chose my reset location as a Pilot in Denham Springs, just east of BR. When you’re going to be sitting for a day and a half, minimum, you don’t want to be stuck at a truck stop that sits by itself, miles from civilization. This Pilot was situated in area that boasted multiple restaurants, a bingo hall, Bass Pro Shop (! ), and a Sams Club (!!! ), all within easy walking distance. And the frosting on this commercial cake? An old friend from my BP Oil Spill days lived within a few miles and hosted neighborhood cookouts every Wednesday night. AND it was Wednesday. To complete the trifecta, he was in town and would be delighted to come and pick me up. I love it when a plan comes together. I took a nice nap in order to be ready for a later than average night. I’d been packing it in between 8 and 9 p.m. for the last 10 days or so because I had been hitting the road at 4 or 5 a.m. 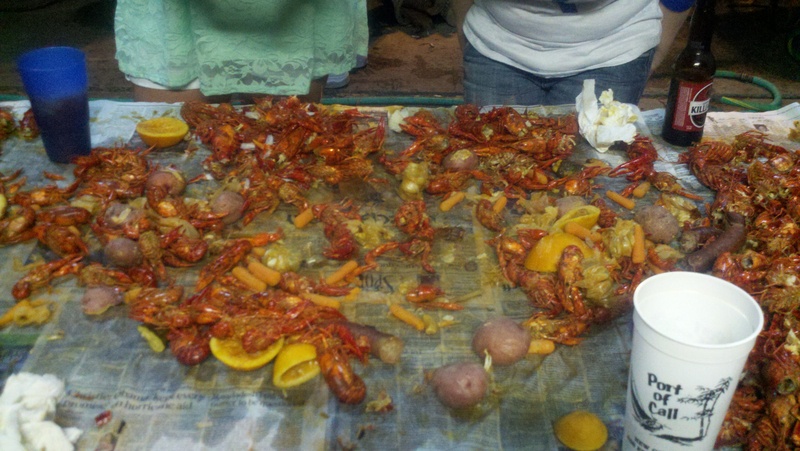 There were three tables full of DEEElicious crawfish. Spicy delectability. Took my contacts out before eating. Dirk McGuyver (my name for him since he struck me as a guy who could go anywhere in the world and blow something up) came. We got caught up. We feasted on boiled crawfish. And since he was pretty well in the bag when he and a friend came to pick me up, he had a friend carry me (that’s southern-speak for “give me a ride”) back to my truck at about 10:30. A great, though long day. A successful delivery, a repaired Auxiliary Power Unit, a nap, and a feast. One of my better all around days in the trucking business. They foolishly kept following me around. Not a great photo. The next day, I slept in, spent part of a leisurely day strolling around the Bass Pro Shop. Saw a ton of stuff I wanted including boats, ATVs, guns, shoes, and various articles of clothing. 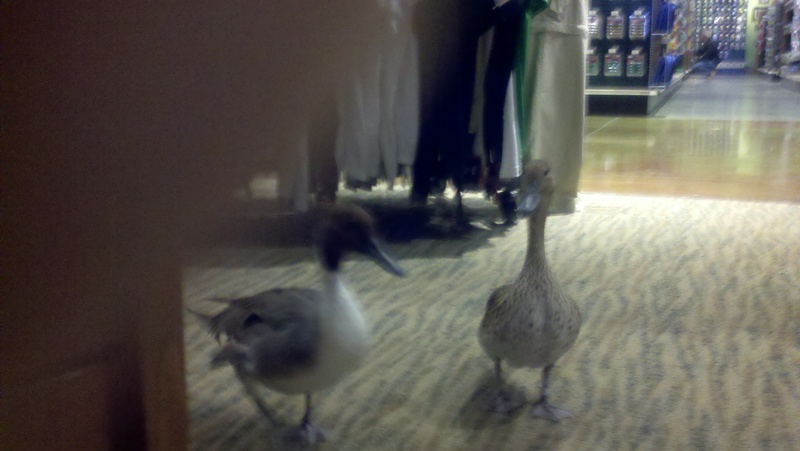 The ducks that were wandering the aisles looked like they might have been tasty. But I left empty handed. I did score some protein bars and trail mix in my trip through Sam’s. I snagged some Mexican food that evening and turned in early since I’d been assigned a load that required a 4 a.m. pick up of refined products (not food?) on the west side of the Mississippi at an Exxon Mobil refinery in Port Allen. Well I’m glad I enjoyed my day because the pickup was really not at 4:00 although that’s when I got there. I was told at the gate that the load wasn’t quite ready. ELEVEN HOURS LATER!!! So after a 34 hour reset I drove about 30 minutes and got to take another 10 hour break. With a fresh clock I drove as far as Baytown, TX. I did not want to get into a cycle of driving all night every night. Shutting down the truck for the night, I heard a hissing from under my tractor. Crap! That brings us to the present. Here I sit (you knew it was coming) at a TA repair shop in Tonopah, Arizona, just west of Phoenix. I got here at around 2:30 p.m. local time yesterday. 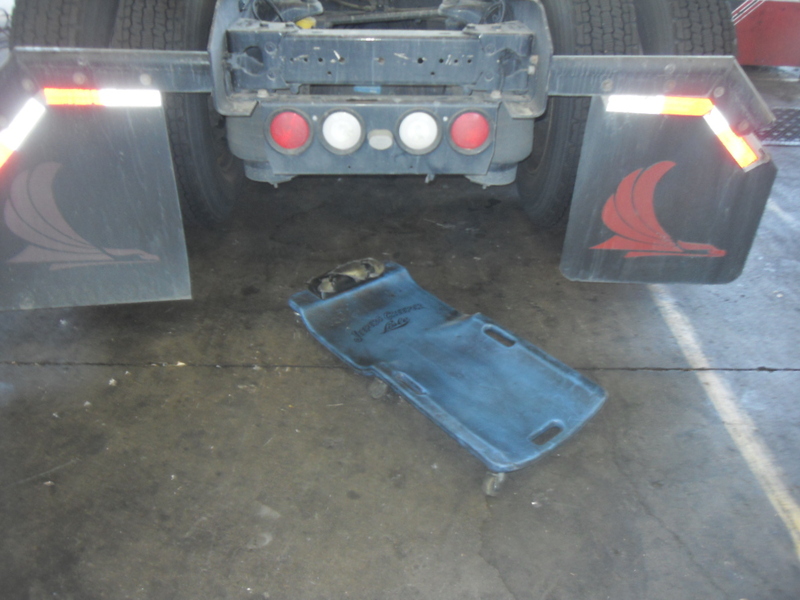 They crawled around under the truck and found that one of the air bags that serves as suspension for the cab had a hole in it. How it got there I’ll never know. This is not a part the TA keeps in inventory. So they had to wait until this morning to get the part from Kenworth in Phoenix. Could be worse. This TA has a Country Pride restaurant with nice dinner and breakfast buffets. So I got a cheap take out dinner last night and a nice breakfast this morning. We’re waiting for the part right now. Since I am waiting, I am not driving. If I’m not driving, I’m not making money. Fortunately (or unfortunately, depending on the viewpoint), my appointment to deliver to a Walmart Distribution Center north of Bakersfield isn’t until 4:30 p.m. tomorrow. I should be able to make that no problem (famous last words). Trouble is, by the time they complete the repair and I get to hit the road once again, I’ll be getting into greater Los Angeles at the beginning of rush hour. [Heavy Sigh] I’ll let you know how it goes after the delivery or repower, whichever comes first.